September 12 – Forget that the customized Oakton Model we’re delivering this November at Waterford Creek is sited on three acres includes over 6,377 sq. 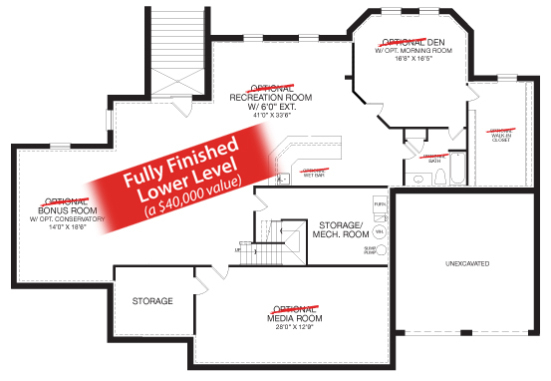 feet of finished space, and a three-car side entry garage. What’s equally impressive is what usually gets the least attention by home shoppers – the lower level. And for good reason. An unfinished lower level often is little more than a dark and uninviting storage/laundry/mechanical system cavern. BUT, finish it, and we think the benefits far outweigh the cost. Why? It’s the quietest, most private area of any home. rec room without facing the consequences of the same actions upstairs. TV or movies in an absolutely perfect environment. it really is a living space instead of a basement. PS – it may not make our top five but don’t underestimate the value of an included wet bar, too. 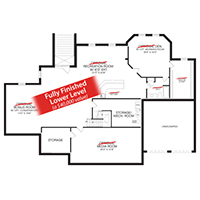 So, we might be including a finished lower level (valued at $40,000) in the price of this home, but, in reality, you can’t put a price on the added enjoyment and advantages it offers your family. Check it out on the Immediate Deliveries page of our website at www.carrhomes.com.